It may surprise some people to learn that I have not one but two pairs of soccer-themed underwear. I suppose an explanation is in order. I got them at H&M when I was in Germany in 2006 during the World Cup. They were discounted and I liked the colors, plus I was in Germany at the time and had been in Argentina earlier that year, so I decided on these two. Also, the fact that they’re still in good condition after 8 years is also a good selling point. Strangely enough, these two teams are playing right now for the world championship. This World Cup has been great–I’ve not watched a single minute of it, and I’ve had an excellent past month. I must admit that I have watched some games in the past, though. 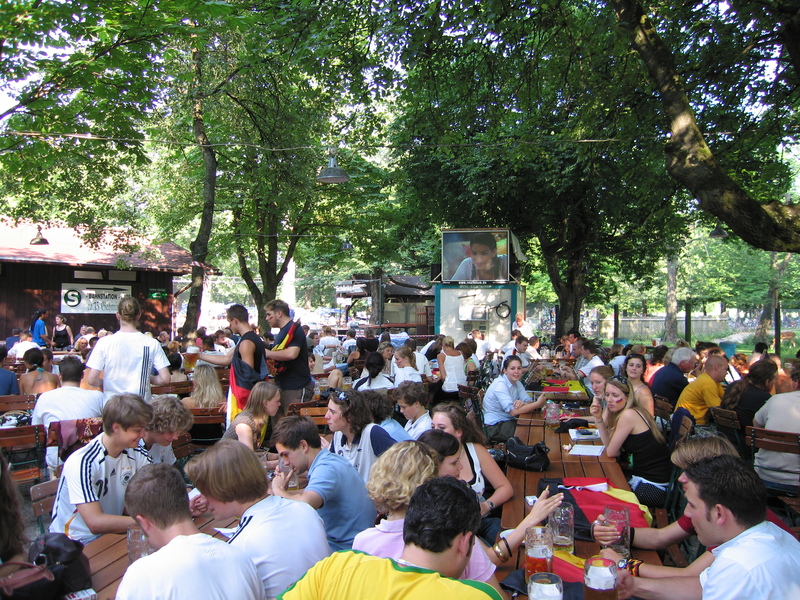 In 2006 I was actually in Germany during the time of the World Cup, and I watched some games in Biergartens and cheered along with everyone else. But this time around, as well as in 2010, I just couldn’t seem to muster up any enthusiasm whatsoever. Why is that? Just for the record, I am not into sports. In fact, that’s probably an understatement, as these days I’m actively not into them. I wrote about soccer and football on my language site, but that was more focused on vocabulary, and didn’t really “get into it” much then. And today I was going to really go off on a rant since it’s the final day of the World Cup (and the final game is even going on as I type this), but I think I won’t. I’m just too tired of soccer and sports in general. So, I’ll just include some random thoughts and call it a day. Watching Sports: Dull or Tedious? 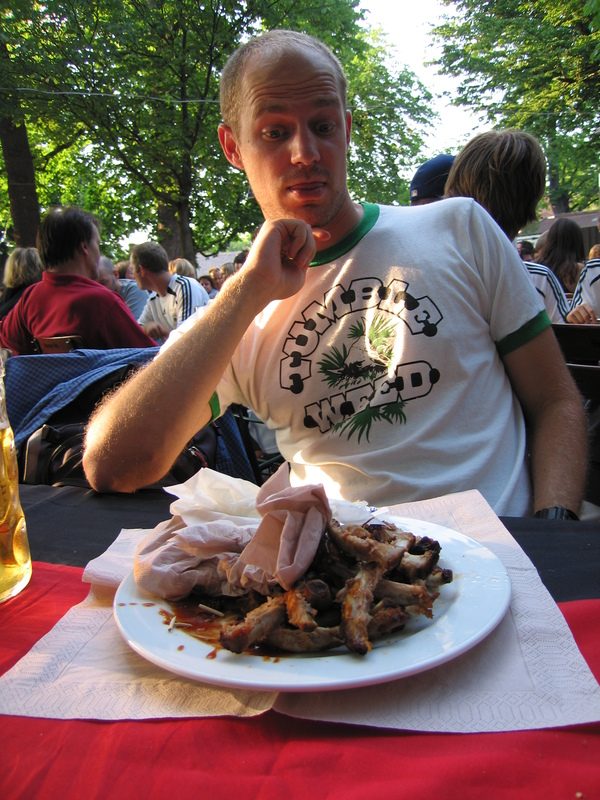 I took this picture in a Biergarten in Munich in 2006 during a soccer game. On that day Germany also played Argentina, interestingly enough. When I was a kid I used to love both playing and watching sports. Now I can maybe tolerate walking around, bowling, and swimming, but I’m not much of a team player, so I don’t really play any sports besides those three. And I watch even less. I can think of 100 things I’d rather do than watch a 90-minute soccer game (which turns out to take about 3 hours a lot of times) or, even worse, a “60-minute” football game (which seems to take 5 hours). That’s not even considering some other sports like baseball, golf, or tennis, which have no time limit. I know that by looking at them as an insult to my time, I’m certainly biased, but I get angry just thinking about watching sports on TV. The only way I can maybe handle watching a sporting event is if I know someone who’s playing, if someone is giving me delicious food or drinks to take my mind off the game, or if there’s a chance there may be some commercials with buxom ladies, cute puppies, or cute, buxom puppies. I also got into a discussion/light argument about this idea on Facebook, since soccer is all anyone has been talking about here for what seems like the last year. Costa Rica’s team played better than they have before, and that’s nice for them. However, I still don’t think it really matters, at least not in any way that I can appreciate. There was a big to-do when the national team came back from Brazil, but the day after, it was the same crap as before, both good and bad. Another thing that rubs me wrong about these games is FIFA. We all know it’s horrible and corrupt, but for some reason I can’t seem to set that aside and enjoy the rivalries. It’s pretty telling if over 50% of the people in soccer-crazed Brazil, the host of the event, were opposed to the Cup. Still, in past World Cups I’ve at least been able to enjoy the idea of some games, like if Germany and Turkey played a soccer game, since there are a lot of people of Turkish descent living in Germany. At least then I could wonder “I wonder what it’s like in Berlin now” in order to take my mind off the tedious game on TV. Or at the very least I could say something like “I’m rooting for Portugal over Spain since I like the color of their uniforms better.” Or like the underwear that I bought in Germany during their 2006 World Cup: I can enjoy many aspects of sports and soccer, except the actual part of watching the games. See, this is the type of sporting event I can enjoy. When you have a beautiful garden filled with trees, beer, good food, and friendly people, with a small screen way at the back, it’s easy to not have to watch the game. Do We Have To Have Another Sport To Watch? I know that writers like Chuck Klosterman have already gone into this idea in much more detail (and said it in a much funnier way), but why does America have to be reminded about soccer every 4 years? I don’t mean that in the “C’mon, America, we shouldn’t have to remind you, you should already be rooting for your soccer team!” kind of way. I mean it in the “Holy crap, seriously? Soccer? We’ve already got so much going on, do we really need to waste a month of our lives every four years thinking about soccer?” kind of way. I’m thinking here in particular of news reports or stories like this recent one on Freakonomics. I really like that show, but there seems to be the underlying idea that America is somehow being left behind by not getting on the soccer bandwagon. And the part of the show where the presenter interviews his teenage son illustrates perfectly what many people find grating about soccer: its pretentiousness. This kid insists on referring so soccer as “football” since that’s what they call it in England (never mind that the word “soccer” also comes from there). They also talk about the “pitch” instead of the field, the “sides” instead of the teams, and the “matches” instead of the games. Now, you can call a game whatever you want (I like “bore-fest”), but if you’re American and use British English words to describe concepts that have very clear words in American English, you’ll sound like the same kind of person who spends a week in England and starts faking a British accent, saying “rather” and “quite” a lot, and talking about trousers, nappies, and lorries; in other words, a tool (and/or Madonna). Anyhow, I know I may be way off on this or out of touch with what everyone thinks. But that’s OK with me. I’m fine being different if it buys be a few hours of free time each time everyone else in the world is sitting in front of their TV watching some millionaires kick, throw, or hit a ball around. No more soccer for me, thanks. I’m full. This entry was posted in Football, Soccer and tagged 2006, 2014, Argentina, Football, Germany, Soccer, World Cup by Sitzman. Bookmark the permalink.